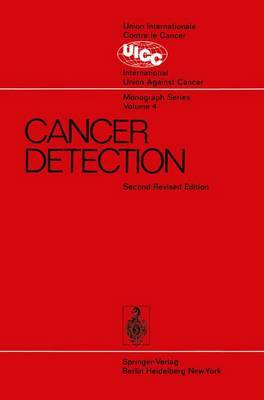 The first edition of this Monograph on Cancer Detection was published by the Inter- national Union Against Cancer (U.I.CC) in 1966. Since that time the Committee respon- sible for that Monograph has gained considerable experience through the organization of a cervical screening programme in Santiago, Chile and a symposium on the evaluation of mass screening programmes in Sheffield, England. The knowledge acquired from these activities, together with the practical advice from participants and the introduction of new techniques of cancer detection have prompted the Committee to revise completely the 1966 publication. It is the hope of the International Union Against Cancer that this revision will prove helpful to all countries involved in or contemplating cancer detection programmes. As the Chairman of the Cancer Control Commission within which the Committee on Cancer Prevention and Detection functions, I take pleasure in acknowledging their dedi- cation and effort in the preparation of this report. The Committee members are: * Dr. A. J. PHILLIPS (Chairman) - Canada Dr. D. A. BoYES - Canada Dr. M. GAITAN-YANGUAS - Colombia * Dr. R. GERARD-MARCHANT - France * Dr. J. KNOWELDEN - England Dr. B. MACMAHON - U.S.A. Dr. M. MONTERO - Chile Dr. T. MORK - Norway Dr. B. TERRACINI - Italy * editorial committee In the preparation of the report the Committee was assisted by Dr. ] OHN WAKEFIELD, a member of the UI.CC Committee on Public Education. E. C EASSON M.D.